Jeffrey Drucker, Regional VP/Northeast Region, Array Architects shared how to evaluate and repurpose unconventional sites for healthcare facilities at the third-annual New York Hospitals and Medical Facilities Summit, and now he’s sharing it with McMorrow Reports readers. Many healthcare facilities are repurposing unconventional sites, such as hotels, garages, retail, warehouses, offices and even residential locations. However, they often come with unique challenges such as limited accessibility, incorrect ceiling heights or floor plates, lack of ventilation or generators. 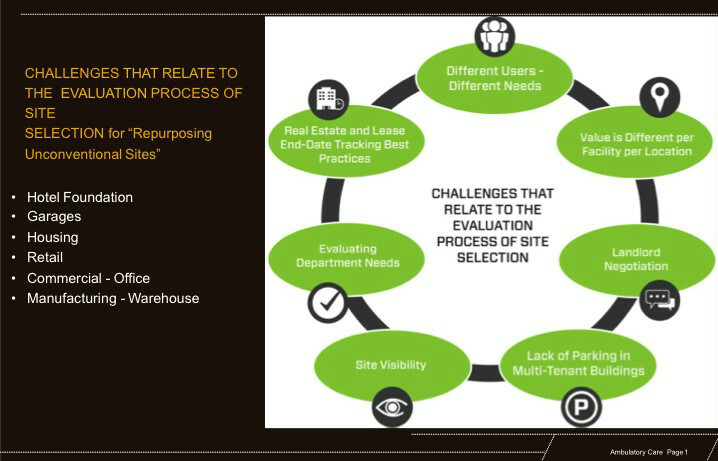 Drucker leads us through the process to properly evaluate the challenges associated with each site, the site selection considerations and a matrix to help teams through these evaluations. Drucker also shares in his presentation multiple examples of problems with different sites.